Abalimi Bezekhaya (meaning farmers of the home in isiXhosa), established 1982, is a non-profit micro-farming organisation that aims to provide basic human necessities for indigent persons, by assisting impoverished groups and communities within the area of Greater Cape Town known as the Cape Flats to establish and maintain their own vegetable gardens, so as to enable those groups and communities to supplement their existing, inadequate supply of food and create livelihoods. Harvest of Hope was set up as a social business that connects the producer and consumers within the food system more closely. It allows the consumer to subscribe to the harvest of the Abalimi farmers and thus share the risks of farming through the purchase of fresh organic vegetable boxes. Abalimi Bezekhaya promotes small scale urban farming. We are a development organization rather than charity, because we partner with active members of the community to aid their efforts in greening, growing and bettering their communities. We provide training, supplies and support to enable the urban poor to obtain employment or become self-employed as gardeners, gardening assistants and urban micro-farmers. We furthermore engage in the conservation, rehabilitation and protection of the natural environment within the Cape Flats. Our garden centers are based in local communities and our Harvest of Hope program helps maintain stable income security for these urban farmers. Harvest of Hope was established as a community-supported agriculture (CSA) system that connects the Abalimi farmers and potential consumers. The aim was to create a social business that should support the sustainability of the community gardens in the Cape Flats area into the future. 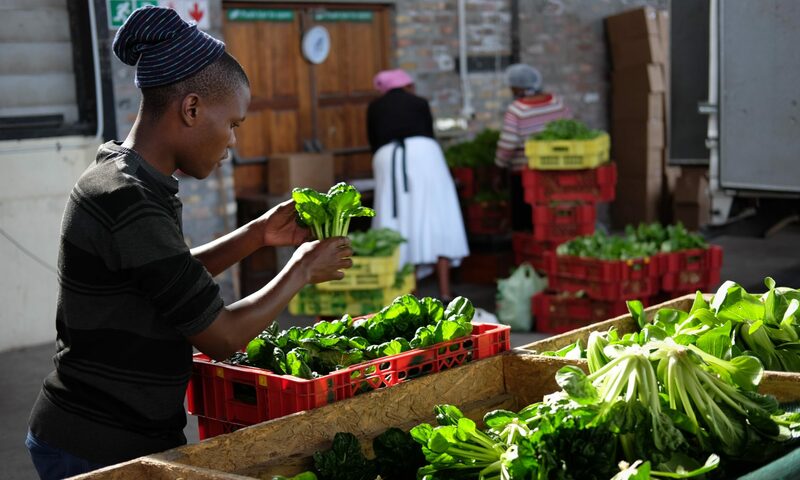 The concept was to sell vegetables in a very direct, friendly and personal way so that farmers would benefit from a secure and fair income while customers would benefit from reasonably priced and locally produced fresh organic vegetables. Customers would also have the knowledge that their money is giving people jobs and conserving the environment through local organic farming among the poor. Collection points were set up around the Cape Town peninsula to allow people easy access to these fresh organically grown vegetables. Wholesale vegetables are also provided to restaurants. Click here for info or to order your Harvest of Hope Vegetable Box. Harvest of Hope was launched at the beginning of 2008 with the kind assistance of the South African Institute of Entrepreneurship (SAIE), The Business Place Philippi and the Ackerman Pick n’ Pay Foundation. Abalimi has community garden centres in both Khayelitsha and Nyanga that provide low-cost, subsidised resources such as seedlings, manure, tools and pest control, and act as demonstration gardens used for training purposes. These centres are based in the community and run by fieldworkers from the community, thus making them accessible and affordable to our target ‘grassroots’ communities. Fieldworkers provide ongoing support to the numerous home gardens and community gardens based at schools, clinics and on municipal land. Various special projects are implemented by the field workers, such as the Young Farmers Training Centre situated at the Siyazama Community Allotments Garden Association (SCAGA). The community is also growing oyster mushrooms at the Moyo We Khaya community garden in Khayelitsha.